Consider this an unofficial companion to Eyal Hareuveni’s recent review documenting some recent output from the Israeli-American free jazz nexus. That post covers a good deal of musical territory and is high recommended. 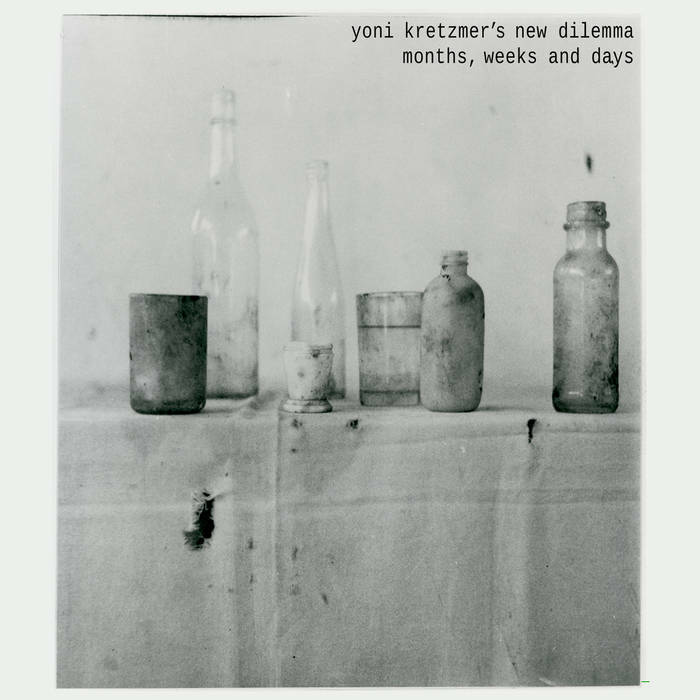 Fortunately, however, it left space for me to review some new releases by two extremely talented Israeli saxophonists: Yoni Kretzmer and Assif Tsahar. Months, Weeks and Days is the second recording of Kretzmer’s New Dilemma experimental chamber group. That is, with a completely new line-up. (I guess that would make this the New New Dilemma.) Consisting of an international/New York-based line-up of Frantz Loriot on viola, Christopher Hoffman on cello, Josh Sinton on bass clarinet, Pascal Niggenkemper on double bass, and Flin van Hemmen drums, this group has a powerful sound. According to the release’s webpage, the group explores “the intricacies differentiating and combining the written and improvised.” Fair enough. In so few words, exploring how partially compose music can take on different forms with each performance, even with the same personnel and directions, is a worthy pursuit, but it is hardly new to experimental music. What is novel, however, is how well this group pulls it off. Months, Weeks and Days spans two discs. Each song is titled after a date, presumably the date on which it was recorded or conceived. The only exception is the final track, “Tishma,” which is Hebrew for “You will listen.” Each track seems to follow the same, basic parameters. Ebb and flow. Tension and release. 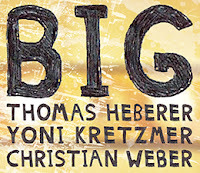 The glue that holds the pieces together are the long, undulating melodies and rhythmic rumblings laid by Niggenkemper, Loriot, Hoffman, and Hemmen. Sinton and Kretzmer, meanwhile, bob in and out of the baseline harmony – a harmony that is at times sweet and unified, and at times ominously discordant - with percussive clucks, muffled trills, and more pronounced melodious phrasings. The tracks can bleed into each other. It takes an attuned ear to decipher, for instance, “March 14th” from “June 14th” once they get rolling. Although the introductions are distinctive, each track collapses into dense, oscillating swells of sound. This similarity, however, does not imply sameness or monotony. Each track has its own feel and expression. This is where the contemporary chamber/new music inspiration really shines through. The tracks have movements of inexact repetition and incremental melodic development. The jazz appears in the more spirited sax and clarinet edifice continually reconstructed atop that protean chamber foundation. The result is deeply engaging and is much greater than the sum of its parts. This album is a marked departure from Months. It is “big” (as per the title) but not big not in the sense of length or loudness. Rather it is big in the sense of vastness, of the balance of quiet and sound, of concepts, of alternating energy and restraint. The first stand-out track is “Münchhausen Trilemma,” a piece that begins with punctuated clucks, squeaks, and plucks, but evolves into a disorienting series of rapid swings from calming extended passages to buzzes, quiet breath, and frantic screams. The extreme upper and lower registers are often present, even when just ominously skulking in the background. The piece then ends in a lamentation imbued with either peace or resignation. “The Sky Above” serves as a counterpoint to the cacophony and fluctuations of “Münchhausen.” It begins with contemplative drones that seem to mimic the slow, serene passage of clouds overhead. Not much happens (or, rather, the dynamics are subtle), but the piece still draw the attention and imagination as one hears forms seamlessly develop and dissipate. The final track, “Everyone in the Cemetery is Dead,” is the longest and serves as a fitting end. As the name implies, this track is spirited, but mournful. At times, Kretzmer sounds like he’s invoking Albert Ayler or maybe even Tsahar, with whom he had studied; Heberer, like “Sketches of Spain”-era Miles Davis. For his part, Weber provides at first the thuds and walking bass, then the mournful arco that anchor the track. Big does not make any definitive statement, nor does it intend to. Especially in this age of digital distribution, there is ample space for provocative recordings like this, sessions where three talented and accomplished musicians sit down and simply work through ideas through dialogical improvisation. It does not always work out. On this album, however, it does. Let me start by saying In Between the Tumbling a Stillness exceeded my already elevated expectations. Tsahar, Parker, and Drake are in expert form. Their playing is tight, responsive, creative, and emotionally exhausting. I envy those who were lucky enough to be in Tel Aviv at Levontin 7 (a club owned by Tsahar) on the night this was recorded. The album consists of three tracks of straight-forward, spirited free jazz. On the first track, “In Between,” Drake lays down tight, endlessly varied grooves for Parker’s bass to dance over. Tsahar weaves rapid scale runs, melodic phrasings, and free blowing – think some combination of Charles Gayle, Peter Brötzmann, and Ornette Coleman (I am trying not to say Albert Ayler, here, but it is difficult) – through the rhythm section. Around the 18-minute mark, Tsahar steps aside and opens space for Parker and Drake to really shine. The overall result is a relentless, toe-tapping onslaught of soulful improvisation. The second track, “The Tumbling,” Parker switches between rapid bowing and pizzicato variations of a deceptively simple, pulsing theme. 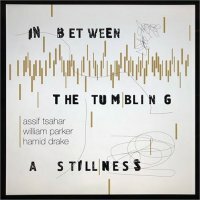 Drake plays a contagious and endlessly varied groove around Tsahar and Parker’s deconstructions, abstractions, and reconstructions of the refrain. This piece is every bit as dynamic as, if slightly less itinerant than, the first. The third track, “A Stillness,” is the shortest and closes the performance with that same type of melodic assault that introduced the performance. Although In Between is not ground-breaking, it holds its own with aplomb. Rather than pushing the boundaries of what can be done conceptually, it shows how powerful, vibrant, and cathartic this type of energy music can still be. Especially for those of you who were excited by Ein Sof (Tsahar, Parker, and Susie Ibarra) and the Live at the Glenn Miller Café releases (Tsahar and Drake), here is another one to add to the top shelf. Nice reviews, couldn’t seem to find In Between the Tumbling a Stillness Hopscotch Records website, is it not out yet? I am with you, Colin. Those albums are definitely worth picking up, as well. Gustav, thanks for the post. I actually had the same trouble as you. I did not see any online presence for the album. Hopefully, though, it is dropping soon. Assif Tsahar's 'big band' albums are also incredible,esp,'Embracing The Void' and 'The Hollow World"-I consider both 5-star albums.The compositions are beautiful and stand the test of time...Thanks for the review . Trying to update William's Sessionography, but cannot find this anywhere. Anyone know a recording date and track times? It was recorded at Levontin 7 in Tel Aviv, Israel. Feb 1, 2015.